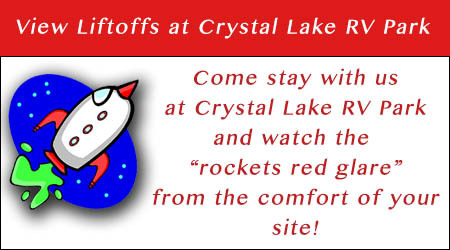 Crystal Lake RV Park | We are in the Heart of it all! Welcome to Central Florida camping! Let us be your Central Florida command center for Florida’s Space Coast camping and adventures. 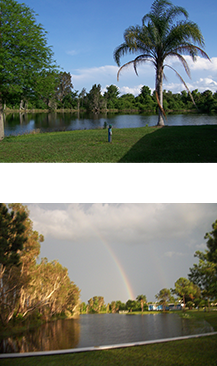 We are located in Mims, close to Titusville and Scottsmoor, and within 30 minutes of Daytona and Cocoa Beach. Advanced reservations are generally required for attending the Daytona 500 and Bike Week. Orlando International Airport and the Disney, Universal, and Sea World theme parks are less than an hour away from Crystal Lake RV Park. For outdoor adventure and birding you can visit the local beaches, Merritt Island National Wildlife Refuge, and the Enchanted Forest. Lots of good fishing is available in the ocean and the Indian River and Mosquito Lagoon. We offer full hook-ups with 20/30/50 amp service, on large, grassy, level RV sites with the majority being pull-thru. You’ll also enjoy full service bath house with laundry and a recreation hall, swimming pool, and 3 acre lake. Wireless internet is provided via 3rd party billing for your convenience. We have daily, weekly, and monthly rates to suit any length of stay. We have spaces available for Tiny Homes!